Pumpkin desserts start to enter my thoughts as soon as the heat of summer fades. Pumpkin has a sweet earthy flavor and a dense fibrous texture that is well suited for the baked goods we make during the Fall and Winter months. When you add pumpkin puree to a batter it turns it a lovely golden brown color and it also provides a moist dense texture. Sweet pumpkin desserts are usually flavored with some combination of ground spices. Normally the spices used have an aroma that is warm and fragrant. My favorites are ground cinnamon which Jill Norman in her excellent book "Herbs & Spices" describes as "a warm, agreeably sweet, woody aroma that is delicate yet intense; the taste is fragrant and warm with hints of clove and citrus". Other spices that I like are ground ginger (peppery with subtle lemon flavor) and ground cloves (rich and spicy). A combination that has become quite popular is pumpkin and cream cheese. I like the richness and tanginess that the cream cheese provides in a pumpkin dessert. Whether it's these delicious Pumpkin Cream Cheese Muffins, or a Pumpkin Roll, a Pumpkin Spice Cake, a Pumpkin Cheesecake, or even Pumpkin Cupcakes frosted with a Cream Cheese Frosting. Pumpkin Cream Cheese Muffins look pretty cool. 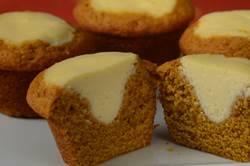 They are similar to the Black Bottom Cupcakes only instead of a chocolate batter we use a pumpkin batter. The Pumpkin Muffin batter is really easy to make. You just 'dump' and stir all the ingredients together. Once the batter is placed in your muffin cups then you simply make a well in the center and insert a dollop of the cream cheese filling. You can even sprinkle some miniature chocolate chips or pumpkin seeds on top of the cheesecake filling if you like. Pumpkin Muffins: Preheat your oven to 350 degrees F (180 degrees C). Place your oven rack in the middle of your oven. Butter or spray each muffin cup with a non stick vegetable spray. Cream Cheese Filling: In your electric mixer, or with a hand mixer, beat the cream cheese until smooth. Add the sugar, egg, and vanilla extract and beat until creamy and smooth. Set aside while you make the muffin batter. Pumpkin Muffins: In the bowl of your electric mixer, or with a hand mixer, beat to combine the flour, sugar, baking powder, baking soda, ground spices, and salt. Add the butter, eggs, vanilla extract, and pumpkin puree. Beat the wet and dry ingredients together at medium speed until the batter is smooth and satiny, about 30-60 seconds. Scrape down the sides of the bowl as needed. Fill the muffin cups evenly (about 2/3 full) with the batter using two spoons or an ice cream scoop. Make a well in the center of the batter of each muffin and then spoon a few tablespoons of the cream cheese filling into the well. Place in the oven and bake for about 18 - 20 minutes, or until the cream cheese filling has set and the pumpkin feels springy to the touch (a toothpick inserted into the pumpkin part of the muffin will come out clean.) Place on a wire rack to cool. Makes about 12 regular-sized muffins.